Almost all Microsoft product (CD) keys are stored in the Windows registry. But you may lose all these keys after your reinstall Windows. PWCDKEY can help you recover lost CD keys directly from Windows registry files. Just specify the full path to the 'Software' file. It is located in the Windows system directory (typically C:\Windows\system32\config\Software). Optionally you can also provide ntuser.dat registry file (some keys are stored under HKEY_CURRENT_USER registry tree). Ntuser.dat is located in the user profile directory. 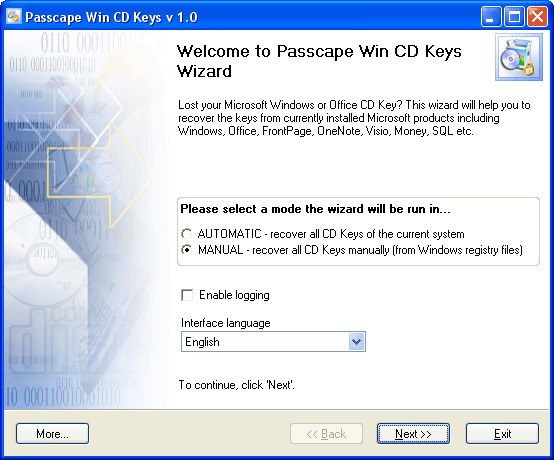 The final dialog box contains found and decrypted CD keys. The OS key(s) is highlighted in green.